The Voxatron experience begins with a polygonal Minotaur smashing the crap out of the production team’s logo. With this in mind, Voxatron really did have me at "hello". This bout of battery sets the scenes for a game heavy on destruction and ruination, but it’s not hard to predict that. What was a tougher call for me was that this game would be the first indie game I’ve played to send me flashing back through the years, like a low budget Highlander, to the first time I stayed up all night playing a video game. The game was Food Fight. The console was the Atari 7800, and the night was long and fuelled by soft drinks. And Voxatron, a shockingly fun arena shooter with cubey, voxel based graphics, caricatured enemies and all-too-destroyable scenery took me right back to staying up all night pummelling chefs with various kinds of food. Now, Voxatron has nothing to do with culinary skirmishes against chefs appearing from portals, by the way. But the point I’m clumsily trying to make after an overlong day at the office is that Voxatron has the same kind of immediate, knife edge, run-in-circles-and-try-not-to-die gameplay that made Food Fight disgustingly good, and which led this reporter to his first ever all night, red eye video gaming shift. Angular is the new smooth, and blocky arena shooter Voxatron belongs to a growing crop of indie games that embrace the square side of life. 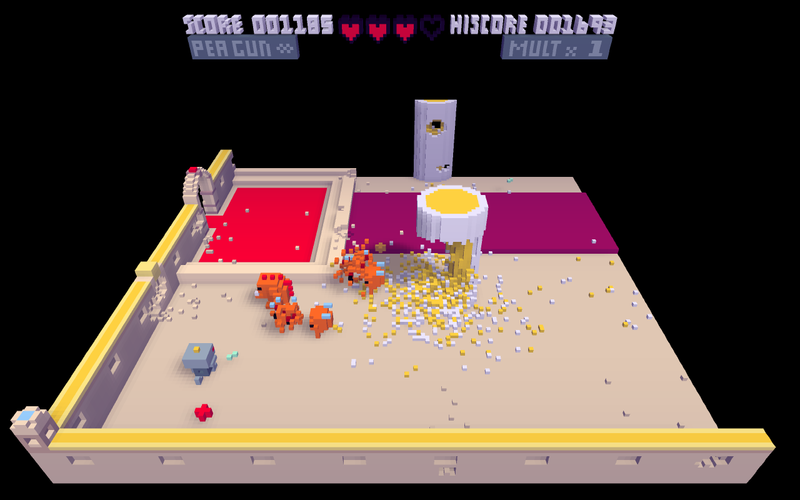 The apparent "everything made from cubes" look of the game is eye catching, distinctive and works perfectly when combined with game-play aspects like the appearance of clunky enemies made up from blocks of smaller, nimbler baddies; but enough about aesthetics, because the game-play and its multiple layers is the real head turner of Voxatron. Arcade Mode was the first mode of play I fired up, because like any good writer I had done zero research beyond finding out the name of the game, and arena modes like this always tend to attract my attention because there’s not much complexity to killing stuff in a box. Within seconds I was running in circles being chased by far too many bad guys and then the Food Fight flashback kicked in. So much fun. Then I checked the readme file to find out how to shoot stuff and it got even better. Even dying in Voxatron is fun, because you leave this world in a huge explosion that atomises your enemies and trashes most, if not all, of the room you’re in; not that the room is going to be pristine by this point, because your basic, un-updated pea gun pots away at the walls, chewing out little divots of voxels, and by the time the Minotaurs have been unleashed and the multi shot bonuses locked and loaded the surroundings are guaranteed to have a distinct post-earthquake look to them. Adventure mode gives another spin to the Voxatron experience, sending the player on a trip through the Voxatron world to die messily in different locations, all unified by quirky, smart level design and a wide range of stuff to kill you, and to be killed by you after a few retries! All the while the player’s block headed avatar bounds and bounces around the screen, leaping over the chunky heads of enemies and scrabbling up the shattered polygons that once were proud towers and sturdy walls. A huge selling point of Voxatron (which is currently going at a “pay what you like” rate, by the way) is the presence of a level and enemy designer. 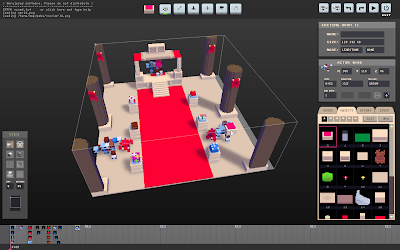 Just like 3D Realms’ inclusion of the Build editor with Duke Nukem 3D, Lexaloffle Games’ decision to ship Voxatron with a voxel editor and mapping tools blasts the game skywards. It opens up the possibilities of the game, and its potential for monstrously addictive fun, to a massive degree. It could only be better if there was a horribly simple, easy way to access levels designed by other players and uploaded to the Lexaloffle BBS. And there is! Downloading user generated content is simple and pretty much instantaneous. This game could destroy your spare time, and smash your social life to pieces like an angry Minotaur because there is so much to do. I’ve barely even looked at the editor mode, not going much further than making sure it was actually there, because I know full well I would descend into a nightmare world of just needing to put one more block right there just so my masterpiece is complete, and never feel the touch of a woman again. Voxatron is brilliant. Just a couple of months ago I found myself wondering if I would ever give a game five joysticks out of five. Here it is. Purchase the game by following the options here (from the Lexaloffle site). 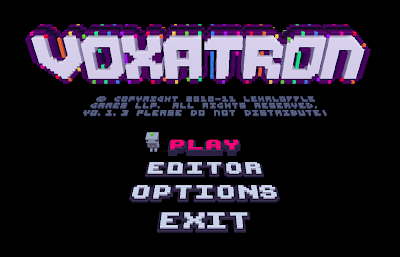 When I first saw the preview videos of Voxatron my initial thought was "damn, that looks ace, but my crappy old desktop will never be able to run it". However, with the required system specifications listed as a '1GHz CPU and any video card' I thought I'd take the plunge and was surprised to discover that this cracking little arena shooter actually runs on everything I've tried it on, including my woefully underpowered notebook. 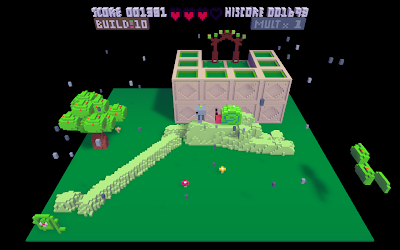 Although still in alpha state, Voxatron is obscenely enjoyable and shows massive potential. You'd be a fool to miss out on the fortnight long pay-what-you-like humble bundle for a copy of the game thrown in together with The Binding of Isaac and Blocks That Matter. 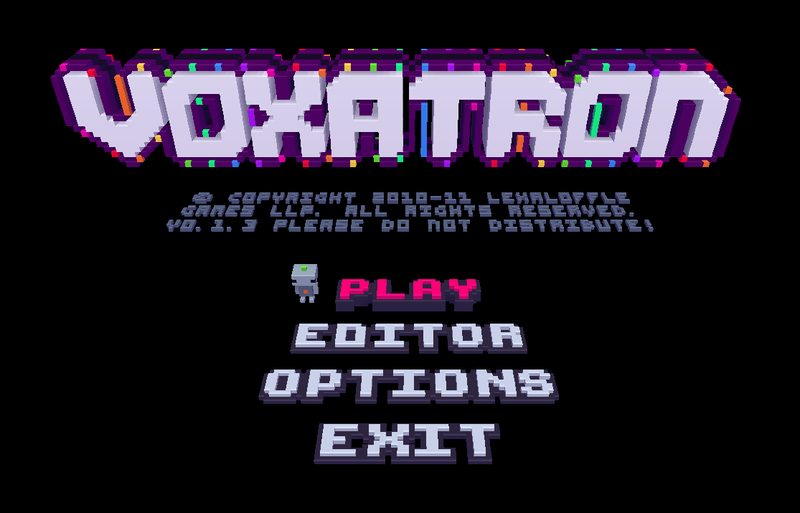 With an update due any day now (complete with configurable controls and proper joypad support) and continued work on the currently unreleased main game underway (the current adventure is just a taster) I fail to see how Voxatron could be anything but an outright success for Lexaloffle. I've heard good things about the two bonus games as well, downloaded them both but haven't had time to try them yet. As luck would have it, I gave it a shot just today! Especially after reading James' comments about low specs, my crappy laptop shouted "CHALLENGE ACCEPTED". Sure enough, it was a slugfest :). To the game's defense though, my laptop is only used for internet activities and running steem engine. Really not impressed by it. 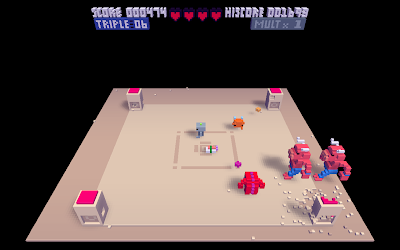 Robotron with voxels? Sure, doesn't sound bad as an idea - it didn't work for me though. I was particularly put off by its "scrolling", ie the lack of it. Moving the camera smoother and doing some space cutting at the edges would have looked 100000 times better. Initially I was super pissed off with the controls, because I mistakenly thought that no 2-"joystick" mode a-la-robotron was offered, but to my delight I was able to configure the keyboard to move with 4 keys and fire with other 4. But then I realised that jumping while having both hands occupied is a bit cumbersome. That was especially bad considering you have to jump to pass some levels. I guess this can be overcome too though (not sure how!). Another thing that annoyed me was that the camera angle confuses you and makes you miss your mark and at some points you don't know if you're running into enemies or enemy bullets. Considering that this is basically robotron we're talking about here where accurate position is a must for survival through tough levels, to me it seems like a design flaw. Maybe this could also be solved somehow with the introduction of some markers or tilting the camera or whatever, but as is it weakens the game. Also, at one level where there were horizontal walls and enemies were hidden behind the walls, it was simply frustrating. Do I sound too negative? Too harsh? I dunno, but that's just how I feel right now. Maybe all the problems I state above will be fixed till the final. But, if they released a demo and gathered feedback instead of forcing the people to buy it to even have an opinion would have helped a lot my judgment! I really don't like this minecraft-like policy of offering a half-arsed game, expecting for the people to pay for it and then finish it if they feel like it. Granted, there are quite some nice ideas in there, and the voxel concept is used cleverly at some points, but as is the game won't hold my interest too much. Bought it for Voxatron, ended up playing Blocks That Matter.... The Humble-Bundle is well worth getting!